Brace yourself. This recipe may be lethal. It just may lead to a sugar overdose. 1. Make a batch of your favorite mini cupcakes – homemade or from a mix. Make them nice and small so you don’t feel guilty about enjoying 2 or 3 of them. If you use paper liners for baking, remove them after the cupcakes have cooled. Pound cake or any other firm cake works well for skewering, but any cake will do. I used a simple yellow box-mix cake. Allow to cool completely before dipping. 2. 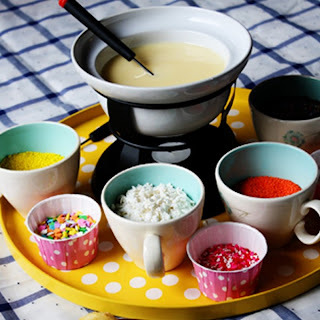 Make the fondue: Whisk together powdered sugar, orange juice, and corn syrup. Adjust the consistency with a drop of liquid or a dash more powdered sugar until you get have a smooth, thick glaze. I used orange juice for the liquid portion to give it a citrus flavor and cheese-like yellow fondue color. You could also use grape juice for a pastel purple, or milk/water and add your own coloring. 3. Pour frosting into the fondue pot. There’s really no need to heat the mixture, but you can keep a small tea light or very low flame underneath just for looks! Display sprinkles and toppings in small ramekins or portion cups and arrange around the fondue pot. Skewer cupcakes in the side and dip the top half into the fondue, then flip the cupcake over and the frosting will drip nicely down the sides. Sprinkle liberally with your favorite toppings.